Author(s): Patrick Hettiaratchi, Department of Civil Engineering, University of Calgary, Calgary, Alberta, Canada. Poornima Jayasinghe, Joo H. Tay, Santosh Yadav. The practice of disposing of waste in conventional dry-tomb landfills is not sustainable. A sustainable alternative is the landfill bioreactor and its variations. Landfill bioreactor approach includes specific design and operation techniques to enhance waste degradation and landfill gas (LFG) production. Although this approach has been known to landfill researchers and practitioners for a few decades, there are only a few successful field-scale landfill bioreactors in operation. This paper provides a comprehensive review of technological challenges with landfill bioreactors and associated design and operational details. A key issue that should be addressed by a landfill bioreactor designer is moisture and gas movement within a waste matrix that changes its properties continuously in time and space. The design components such as the leachate collection and removal system (LCRS), leachate recirculation system, and gas collection system could be severely impacted if the traditional landfill design and operation practice is not modified to take into consideration the behavior of waste matrix in time and space. Considering that a landfill bioreactor can be used as a biomass waste to energy facility, this paper details the LFG generation processes, the factors affecting the LFG generation and theoretical LFG generation estimation techniques as well as the important design, construction and operational issues associated with landfill bioreactors. 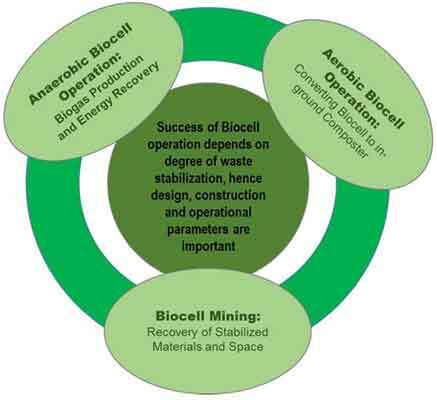 Keywords: Anaerobic waste degradation, biocell, landfill bioreactors, leachate recirculation. Affiliation:Department of Civil Engineering, University of Calgary, Calgary, Alberta, Canada. Keywords:Anaerobic waste degradation, biocell, landfill bioreactors, leachate recirculation. Abstract:The practice of disposing of waste in conventional dry-tomb landfills is not sustainable. A sustainable alternative is the landfill bioreactor and its variations. Landfill bioreactor approach includes specific design and operation techniques to enhance waste degradation and landfill gas (LFG) production. Although this approach has been known to landfill researchers and practitioners for a few decades, there are only a few successful field-scale landfill bioreactors in operation. This paper provides a comprehensive review of technological challenges with landfill bioreactors and associated design and operational details. A key issue that should be addressed by a landfill bioreactor designer is moisture and gas movement within a waste matrix that changes its properties continuously in time and space. The design components such as the leachate collection and removal system (LCRS), leachate recirculation system, and gas collection system could be severely impacted if the traditional landfill design and operation practice is not modified to take into consideration the behavior of waste matrix in time and space. Considering that a landfill bioreactor can be used as a biomass waste to energy facility, this paper details the LFG generation processes, the factors affecting the LFG generation and theoretical LFG generation estimation techniques as well as the important design, construction and operational issues associated with landfill bioreactors.